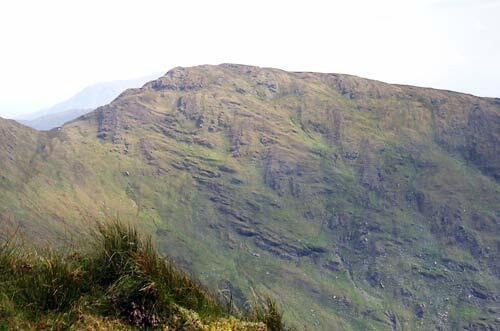 Beann South Top is the 221st highest place in Ireland. Picture from simon3 : View from Beann S to NW. Picture: View from Beann S to NW. 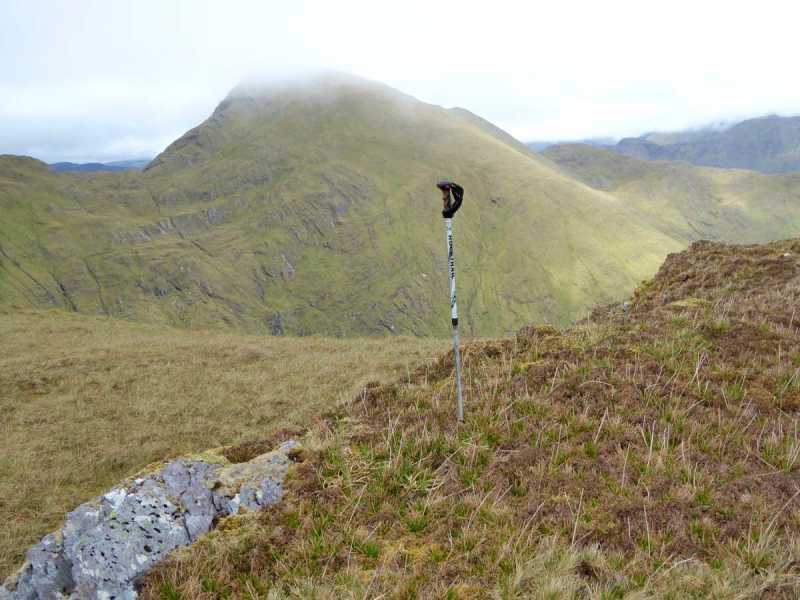 There are several ways up this mountain which is one end of the Mullaghanatin circuit. Largish groups or any group that can fix a car split could walk in from the south as described by Eric for Beann. (On the main Sneem to Moll's Gap Road is the townland of Lettermoneel (OS Map No.78). 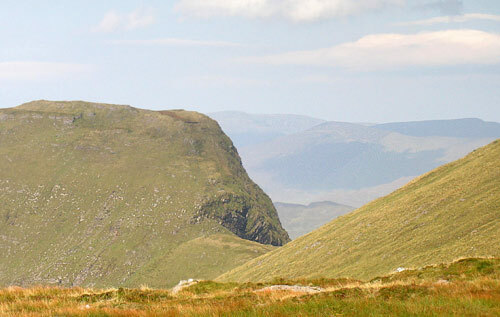 From here take the ridge via Eskine, Knockarig & Faher Mountain.) Although I haven't tried it, probably it would be possible to get onto this ridge at Kealariddig for example through the forests at V721720 D or V722717 E. Very possibly a group could also get onto the ridge from somewhere near Gortfadda. Check it out and let MV know. A group of up to 5 or 6 can go down to the junction at Tooreennahone (V747746 F). Ask permission at the last house before the junction. There is parking at V745745 G for 2 cars only just over the bridge on the lane SW of the junction. The walk starts further down this lane. Ask permission at the last house on the left. Shortly before you come to it a track starts off left uphill - this is the start of the route. (Also ask if you are doing the circuit anti-clockwise and plan to arrive back here.) The track is marked on the map and is shown correctly at the bottom. However the actual route diverges to the left from the map as you climb and go a few hundreds of metres. Follow the actual track, then gain the ridge and proceed to the top. (Do the reverse if coming down. Do not go East of the actual track.) Do not go immediately north of the lane SW of Tooreenahone. Whatever you do around here, ask permission when necessary and respect the local landowners. Don't start large parties from around Tooreennahone. There isn't enough parking and for other reasons. There are alternatives. Let MV know of any changes. Picture from simon3 : Beann South top from the west. Picture: Beann South top from the west. Walking up Beann South Top (BST) from the south you will be well rewarded in clear weather by taking the scenic route over the east spur ( height 531). There's a great view of Mullaghanattin. While BST will always play second fiddle to the other summits of the Mullaghanattin circuit, it does have a steep NE side. From there you will get an uninterrupted view of over 600m of mountainside, starting from "The Pocket" with its lush greens and meandering streams to the flanks with big outcrops to the bare summit. Very striking in the morning with the sun at your back.